The Homall Executive Swivel Chair is perfect for someone who wants to look and feel like a pro gamer at a reasonable cost. The Homall Executive Swivel Chair has a real pro streamer look to it. The tall, striped racer back with a matching head cushion will make you look like your favorite Twitch star, but at a much more reasonable price than the sponsored gear the elites use. We have a few ergonomic quibbles, but overall Homall offers a solid and stylish entry point into executive/racer-style chairs that won’t break the bank. We spent over a week with the chair in our apartment to evaluate ease of setup, design appeal, and overall comfort, to judge if it deserves a place in your home. The chair makes a striking first impression, with a bold, black and white pattern running up the whole leather cover, echoed all the way down to the base and wheels. The polyurethane-embossed leather is smooth, cool, and easy to clean. After a week of regular use, the foam padding remained soft. The stitching also remained set during our testing, but it did look a little loose to begin with. The optional, adjustable head and lumbar pillows are a nice touch, although we found the lumbar pillow to be a little too prominent and firm for our liking. The tall, racer-style back is comfortable and supportive for even a fairly large and broad-shouldered adult man, tilting back down to a full 180-degrees. We found this feels a little too tenuous to comfortably kick back that far, but the deep range is appreciated and people with low centers of gravity will probably find it fairly stable, as the chair’s base is quite sturdy. The arms are at a fixed height, which is a minor annoyance. The tall, striped racer back with a matching head cushion will make you look like your favorite Twitch star, but at a much more reasonable price than the sponsored gear that the elites use. While setting the height of the chair and the back’s tilt is easy, the mechanism leaves something to be desired. To adjust the tilt you have to use a stiff knob that’s placed in an awkward-to-reach location on the underside of the seat. More crucially, the way your center of gravity sits relative to the pivot point makes it hard to stay leaning back without really pushing with your legs. It’s just not sustainably comfortable. Assembling the chair was relatively easy, taking one person about an hour. All of the necessary components are separately wrapped and easy to find, provided you follow the clear, printed instructions. There was a minor discrepancy between a few of the parts’ designations in the manual and on the parts themselves (e.g. L3 vs B3), but their unique shapes made them simple enough to distinguish. A combined Allen wrench/Phillips screwdriver comes included and is all you need to get the job done, though it’s not quite as effective as having separate dedicated tools. We did have a bit of difficulty attaching some of the plastic covers that shield the chair back’s bending mechanism. Ultimately, we failed entirely to attach one of them. The flat, short screws don’t catch easily on the edge of their corresponding holes. To make matters worse, the point of contact is shielded from vision entirely by the cover you’re screwing on, making it very difficult to line it up. It’s a purely cosmetic piece, so this failure didn’t have any functional implications, but it was nevertheless frustrating. For all of the included features and the quality of comfort, components, and construction, the Homall Executive Swivel Chair offers a great value at $169.99. It’s an excellent entry-level price point for an executive, racer-style chair, which normally cost twice as much. It’s an excellent entry-level price point for an executive, racer-style chair, which normally cost twice as much. Gaming chairs are a crowded space, but Homall seems to slightly outpace its peers in terms of quality. Amazon is full of very similar offerings from little-known manufacturers like Furmax and Devoko at a comparable or slightly lower price, but Homall is generally rated better in terms of comfort, especially over the long term. 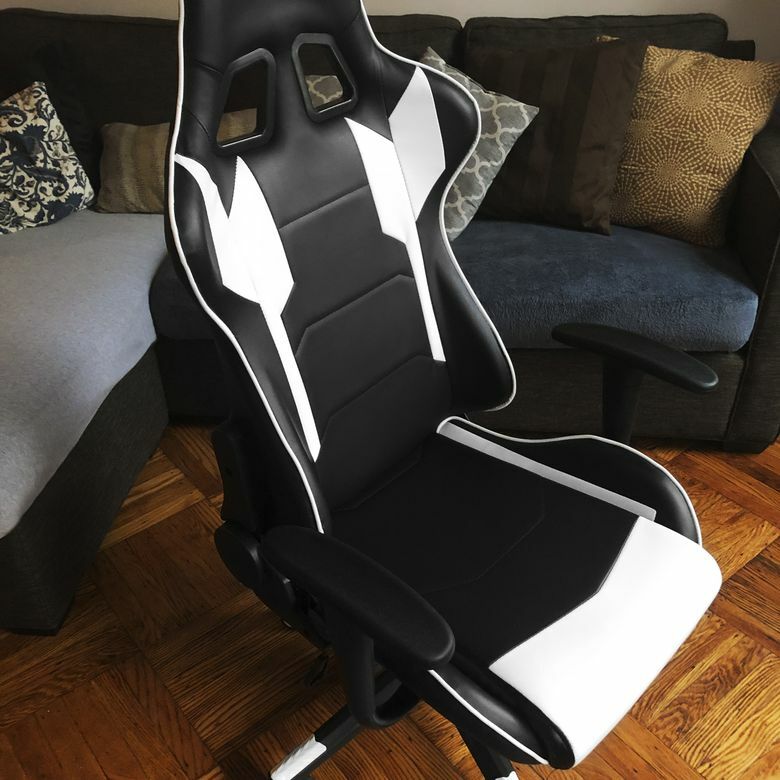 If you want a better-known brand, you’ll end paying close to $300 for something like the well-liked Racing Series DOH/RW106/NR from DXRacer. If you’re on a budget, Homall is an appealing choice. Check out our other reviews of the best gaming chairs available on the market today. Comfort and style at an attainable price. After hours of use, we found the Homall Executive Swivel Gaming Chair as comfortable as much more expensive chairs, without seeming to lose anything in terms of build quality. So long as tilting back isn’t a dealbreaker for you this is as good as gaming chairs get until you start paying a lot more. Product Dimensions 32.7 x 15.3 x 29.1 in.